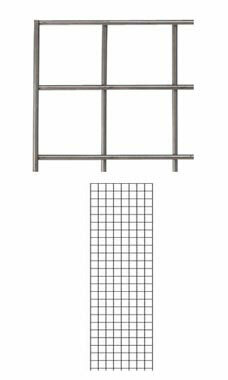 Create more space anywhere you need it with this Raw Steel Wire Grid Panel. This grid panel measures 2’ x 6’ and is constructed with wires spaced 3” on the center with double wires on the sides of the panel for additional support. These panels are great for mounting on the wall and can be enhanced with face outs, peg hooks, shelves, and baskets. The contemporary finish has a sleek style that goes great with all of the stunning racks in our raw steel collection! Learn more about Wire Grid Panels in the Customer Connection section of our website!